Introduction: In previous articles i explained How to bind Repeater data control and How to bind, edit, update and delete data in Repeater. and Bind,Save,Edit,Update,Cancel,Delete,Paging example in GridView in asp.net C# and How to Bind and implement Custom paging in asp.net DataList control in 3 different ways and Delete multiple selected records based on CheckBox in GridView and How to upload, download and delete files from GridView in Asp.net? 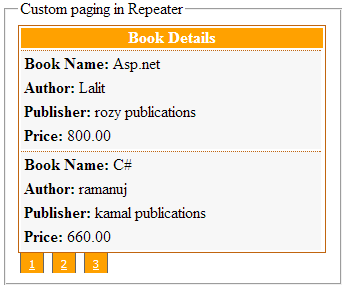 Now i am going to explain with example How to implement custom paging for repeater data control. Description: Whenever large amount of data need to be displayed in Repeater control then we need of paging to break data in pieces. But as we all know there is no in built paging in Repeater control. But we can take the advantage of custom paging through which we can achieve same paging results as for other control like GridView. As it is custom paging we can also make it look different. Let’s take an example. Now in the web.config file create the connection string to connect the asp.net application with the sql server database as. Note: Replace the Data Source and Initial Catalog(i.e. Database name) as per your application. style="padding:8px; margin:2px; background:#ffa100; border:solid 1px #666; font:8pt tahoma;"
it is always nice to hear that my post helped anyone..thanks rajesh..stay tuned and stay connected for more useful updates like this. hello! How can i set the enabled and disabled pagination number. E.g. i'm in page 2, i want to highlight page number 2. It should highlight the selected page. Please help thanks! Sir Can you please help me in repeater.I have checkboxes in repeater cntrol and I want to display selected checkbox values on grid.I have Show Data button.When I press this button it should show selected records on grid.My repeater is using paging and I want to maintain checkbox states on different pages of repeater.